Chester County District Attorney Tom Hogan said today that two reports of people finding needles in candy after trick-or-treating in Kennett Square on Halloween last Saturday are "unfounded." 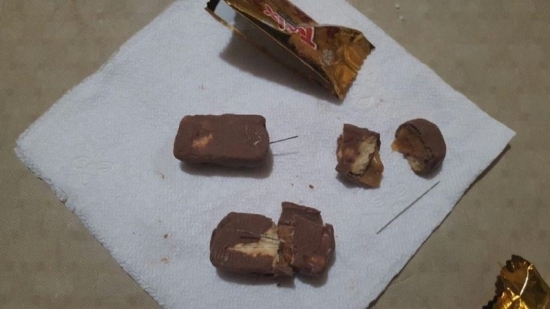 The first incident involved an 11-year-old girl who put her mother's own sewing needles in a Twix chocolate bar. She showed it to her parent's who called police. A 12-year-old boy heard about the first girl's discovery and put a needle in a Snickers bar and showed it to his sister who alerted authorities. Both children were out in the Stenning Hills neighborhood. Police were busy trying to track down the source of the dangerous treats and neighbors were on edge. The children have both recanted their stories. No charges will be filed. Philadelphia Police are investigating after a man and a woman were found shot to death in an SUV in Fairmount Park this afternoon. They were discovered by a maintenance crew emptying trash cans around 2:40 p.m. on the 800 block of Lemon Hill Drive. The back window was shattered and police believe it was shot from within the vehicle. They do not know if it was a murder-suicide or a double murder but they believe the victims were targeted. The victims were in their 30's and partially dressed. Homicide investigators plan to take the vehicle with the bodies inside back to the Medical Examiner's office to examine the entire SUV. A woman identifying herself and the victim's girlfriend, his mother, and grandmother arrived at the scene after tracking his “Find my iPhone” app, but investigators couldn't give them any more answers at the moment. UPDATE Saturday 11/06/15: Police say that the victims, a 25-year-old African American man and 32-year-old Hispanic woman, had been dating. They have ruled out murder-suicide. They each had multiple gunshots to the head but no gun was found at the scene. Family members at the scene had been searching for the male for about a day. Philadelphia has been named a World Heritage City, the first city in the United States to earn such a designation. The Organization of World Heritage Cities voted today in Peru. Independence Hall is already a UNESCO World Heritage Site. The Declaration of Independence, Articles of Confederation, and The U.S. Constitution were all debated and signed in that building. “The universal principles of freedom and democracy set forth in these documents are of fundamental importance to American history and have also had a profound impact on lawmakers around the world,” according to UNESCO's website. There are 260 other cities around the world designated as such including Jerusalem, Paris, and Cairo. Mostly Cloudy, temperatures in the low 70s/upper 60s this evening in Center City.